Provide comfort for the family of Shelia Faye Avants with a meaningful gesture of sympathy. Funeral services for Mrs. Shelia Faye Mullins Avants, of Zachary, LA will be on Friday, December, 7, 2018, at Charlet Funeral Home in Zachary, LA at 10 AM, with burial to follow in Azalea Rest Cemetery in Zachary, LA. Rev. Tony Mullins will be officiating the services, with Charlet Funeral Home in charge of the arrangements. Visitation will be at the funeral home on Thursday, December 6, 2018, from 5PM until 8 PM.Mrs. Avants, 66, passed from this life on Monday, December 3, 2018, at her residence with her loving family by her side. She was born on November 19, 1952 in Natchez, MS to Mr. Louie Mullins and Mrs. Bessie Rollins Mullins. Shelia was born into a large family of twelve children where she learned that hard work and clean fun would lead to a joyful life. She had a number of pleasures in life but the one that brought the most joy was being around her family to fellowship, share life experiences, smile, and laugh. She loved her family very much. Her passing creates a void that will not be easily filled. She will be missed very much. Preceding her in death were her parents; Louie and Bessie Mullins; two sisters, Maggie Bell Dantzler and Mildred Sproles; three brothers, infant Ray Mullins, Louie Winston Mullins and William Harold Mullins. Those left to cherish her memories are her husband of 46 years, William “Billy” Avants; four sons, Mitchell Avants, Matthew Avants and wife Dawn, Christopher Avants and wife Brandi, and Casey Avants; two sisters, Dorothy Ann Young and Carolyn Sue Rollins and husband Reginald, four brothers, James Franklin Mullins and wife Linda, Stanley Ray Mullins and wife Sylvia, Tony Mullins and wife Paulette, and Marty Mullins and wife Cindy. 6 grandchildren, Gage, Bailee, Rylie, Caleb, Brooklyn and Baby Girl Avants due in January 2019, along with many nieces, nephews and friends. Pallbearers will be her sons, grandsons and Charlie Harrison. Special thanks to Pinnacle Hospice, Anne Bolton, Shelley Wintz, Diane Annison and Marsheila Glenn for all of your care and compassion given to Shelia during this time. 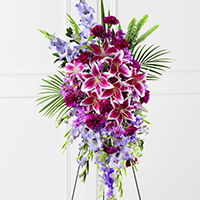 To send flowers in memory of Shelia Faye Mullins Avants, please visit our Heartfelt Sympathies Store. We encourage you to share your most beloved memories of Shelia Faye here, so that the family and other loved ones can always see it. You can upload cherished photographs, or share your favorite stories, and can even comment on those shared by others. Cajun Valve sent flowers to the family of Shelia Faye Mullins Avants. Wishing your family comfort in this time of sorrow. Our thoughts and prayers go out to you and your family. Cajun Valve purchased the The FTD Tender Touch Standing Spray for the family of Shelia Faye Avants. Your family has my deepest sympathy. I am so very sorry to learn of the loss of Ms. Shelia, someone so beloved. I was thinking of something to say to ease the tremendous pain that your family is suffering. So I compiled this list of scriptures that is sure to bring you comfort in this difficult time: Psalms 55:22; Proverbs 3: 5 & 6; Isaiah 41:10; 2 Corinthians 1:3-7; James 4:8; and Revelation 21:4. Be strong. Cherish the memories. May the peace of God be with your family always. And, please, remember to call upon his name found at Psalms 83:18.